World ports organisation to present toolbox and experience of leading ports at next week's Marine Environment Protection Committee meeting of the International Maritime Organisation. With the upcoming IMO MEPC73 meeting in London next week focussing on an action plan to reduce shipping-related greenhouse gas (GHG) emissions, the International Association of Ports and Harbors (IAPH) will present its climate-related work to the IMO in an open session , with member ports of Los Angeles , Rotterdam and Yokohama showcasing their initiatives. 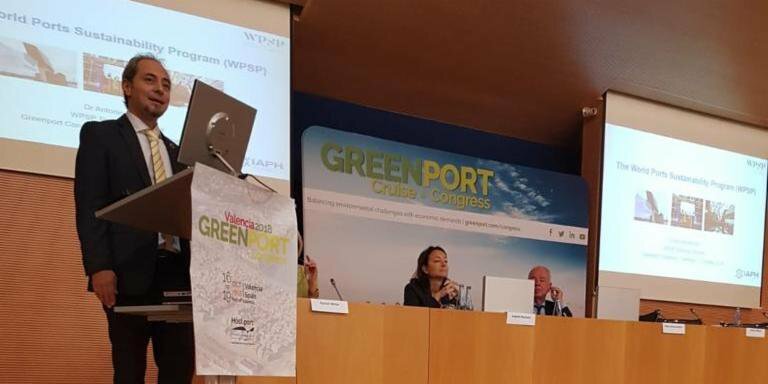 Some of this work was highlighted earlier today by World Ports Sustainability Program's Technical Director Antonis Michail, who addressed delegates at the GreenPort Congress in Valencia. He encouraged ports to submit projects to the Program and focussed in particular on plans to further develop and expand the Environmental Ship Index (ESI), a scheme providing the means to assess vessel performance on air emissions relative to IMO rules. "Under the umbrella of the World Ports Sustainability Program, key participants from both shipping and ports have voluntarily collaborated to successfully designing and deploying tangible, climate-related projects like the Environmental Ship Index (ESI) and the LNG Bunkering audit tool. We believe that this united approach will be key to a successful implementation of the IMO strategy, effectively moving us towards to a zero-carbon maritime industry, both through short-term and longer-term measures." On 12 May 2017 the International Association of Ports and Harbors decided to set up a World Ports Sustainability Program. Guided by the 17 UN SDGs the program wants to enhance and coordinate future sustainability efforts of ports worldwide and foster international cooperation with partners in the supply chain. The World Ports Sustainability Program The World Ports Sustainability Program covers five main areas of collaboration between IAPH member ports : resilient infrastructure, climate and energy, safety and security, community outreach and port-city dialogue, governance and ethics.